Deer can be a menace to your garden. Keep them away with these tips. Some people love deer, and others can’t stand them. However, most people will agree that they are gentle and majestic creatures. A family of deer that strolls through your property can be a real sight to see. You may welcome them into your yard; however, you may change your mind when you realize most of your plants are half-eaten. If you want to keep deer from nibbling on your prized flowers, here are some steps you can take to keep deer out of your garden. One of the easiest ways to keep deer from entering your garden is physical barriers. There are several styles of fences available today. However, it is important to remember that deer are incredible jumpers. If a deer sees a delectable plant species through a fence, they may be enticed to jump over if it is not high enough. If you do not want your garden to shielded by a tall fence a less expensive route you could opt for is chicken wire or plastic netting. Here are some of the top deer repellent products on the market today. Both of which are available on Amazon at reasonable prices. Deer Out – This deer concentrate repellent is widely considered to be the best one the market. It is extremely effective and guarantees results. It is environmentally friendly and safe to use on crops. A single application could last you several months. Deer have a difficult time tolerating the peppermint smell this product possesses. I Must Garden – This affordable product is easy to use, and usually produces good results. It comes in a spray bottle and possesses a spice scent that deer hate. For those individuals who are concerned with price, this is a great option. It is also safe to spray on plants and a bottle should last a user a long time. Instead of opting for a repellent to keep deer out of your garden, you can use the following products to scare them off instead. These products are also reasonably priced and can be found on Amazon as well. Water Jet Spray – These motion-sensor devices will spray water and make some noise when activated. 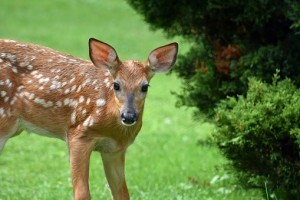 They will do an excellent job at keeping deer and other critters away from your plants. This is a humane and safe option to consider. Predator Light Guard – This product should keep deer out of your garden at night. It operates off a solar panel and flashes LED lights. In most cases, deer see these lights, assume it is a predator, and then take off. Mount this product on your property and your plants will thank you for it. Have you noticed that deer love eating a particular plant in your garden? If you are, it may be time to switch it out for a deer resistant plant. For example, hosta is a favorite of deer. If yours is always getting eaten, you may want to consider switching it out for a different plant. Deer usually won’t touch anything that is prickly, fuzzy or fragrant so ask your plant supplier or landscaper for advice. This entry was posted on Saturday, July 15th, 2017 at 9:11 am. Both comments and pings are currently closed.